Crazy ants (on the right) coat themselves with formic acid to neutralize the venom of the fire ant (at left). Credit: Lawrence Gilbert, University of Texas-Austin. Last year, the researchers reported that where crazy ants take hold, the numbers and types of arthropods—insects, spiders, centipedes and crustaceans—decrease, which is likely to have ripple effects on ecosystems by reducing food sources for birds, reptiles and other animals. They also nest in people's homes and damage electrical equipment. There is one bright spot for humans. 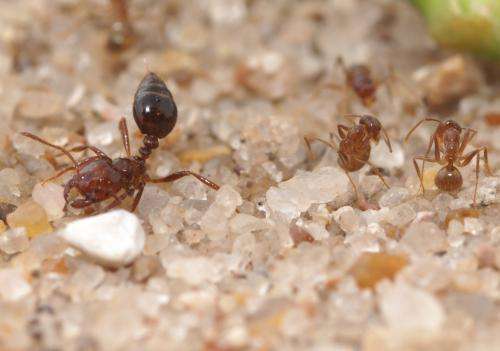 Unlike fire ants, colonies of crazy ants spread very slowly—about 600 feet per year. The only way they can spread long distances is when transported by people in potted plants and recreational vehicles. LeBrun suggested that people not buy plants if they see ants nesting in the pots and that if they live in areas already invaded by crazy ants, they check for stowaways when they move homes or travel long distance. More information: "Chemical Warfare Among Invaders: A Detoxification Interaction Facilitates an Ant Invasion," by	E.G. LeBrun et al. Science Express, 2014. Wouldn't Darwin say that the small percentage of fire ants with effective venom would remain and reproduce? But in the entire article it never once mentions why the hell they're called crazy ants! 50,000,000,000 fire ant-crazy ant interactions, held over geologic time (1,000,000 years), maybe. Critters go extinct, both locally, regionally and globally, and new critters appear, all the time at those scales. I don't even know why I'm talking to trolls. .
And no, Darwin never met a fire ant, or a crazy ant.